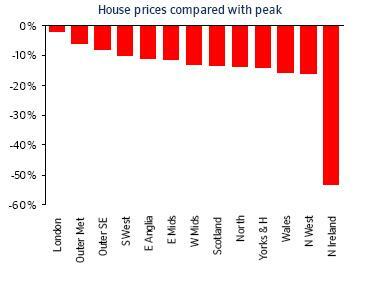 The Nationwide Building Society has this morning published its UK House Price data for September 2012. The Nationwide tends to be the first of the two UK building societies (the other being the Halifax) to produce house price data each month, it is one of the information sources referenced by NAMA’s Long Term Economic Value Regulation and is the source for the UK Residential key market data at the top of this page. The Nationwide says that the average price of a UK home is now GBP £163,964 (compared with GBP £164,729 in August 2012 and GBP £162,764 at the end of November 2009 – 30th November, 2009 is the Valuation date chosen by NAMA by reference to which it values the Current Market Values of assets underpinning NAMA loans). UK prices have declined by 1.4% in the past 12 months and are now 11.9% off the peak of GBP £186,044 in October 2007. 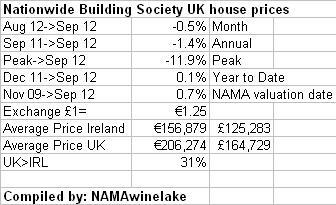 Interestingly the average house price at the end of September 2012 being GBP £163,964 (or €205,316 at GBP 1 = EUR 1.2522) is 31% above the €156,879 implied by applying the CSO August 2012 index to the PTSB/ESRI peak prices in Ireland. With the latest release from Nationwide, UK house prices have risen 0.7% since 30th November, 2009, the date chosen by NAMA pursuant to the section 73 of the NAMA Act by reference to which Current Market Values of assets are valued. The NWL Index is now at 802 (because only an estimated 20% of NAMA property in the UK is residential and only 29% of NAMA’s property overall is in the UK, small changes in UK residential have a negligible impact on the index) meaning that average prices of NAMA property must increase by a weighted average of 24.7% for NAMA to breakeven on a gross basis. This morning the Nationwide has also published its quarterly commentary which provides a regional analysis of prices. London has still performed best over the past 12 months though it was the North of England which performed best in the last quarter. Northern Ireland is bottom of both the quarterly and annual leagues. 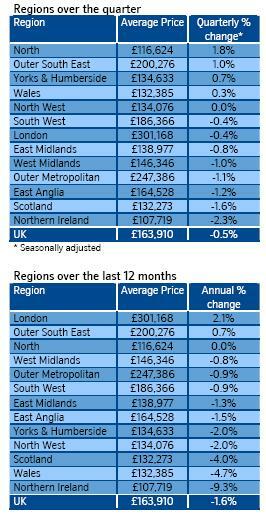 With annual inflation in the UK running at 2.5-3%, ALL regions have seen real falls in the past 12 months. Northern Ireland deserves special mention as its decline from peak is so out of proportion with the rest of the UK, its decline from peak is over 50% compared with the next worst performing region, the North West of England at around 15%. It would be interesting to research why one region in a union of countries with the same currency, the same prime minister, the same laws, the same planning guidelines and the same banks has seen a profile of prices so out of sync with other regions of the same union. According to the UK’s Office for Budget Responsibility which independently monitors and comments on the UK economy, house prices are projected to fall by 0.4% in 2012 before increasing by 0.1% in 2013, 2.5% in 2014 and 4.5% in 2015 and 4.5% also in 2016. UK inflation has now come down below 3% per annum despite being elevated since the banking crisis in 2007, overall inflation in 2012 is set to stay close to 3% – remember that UK inflation has increased by over 16% since their peak whereas in Ireland inflation has been subdued and is one third of that – the UK has pumped GBP0.3tn of “quantitative easing” into its GBP1.5tn economy and another GBP50bn has recently been announced. UK interest rates may increase later this year to combat inflation – the base rate has been 0.5% since February 2009.The UK economy is officially projected to grow by an anaemic 0.8% in 2012 in real terms, close to our own Department of Finance’s projection for Ireland at 0.7%. However both the Bank of England and the Confederation of British Industry have recently projected nil growth or recession in 2012.